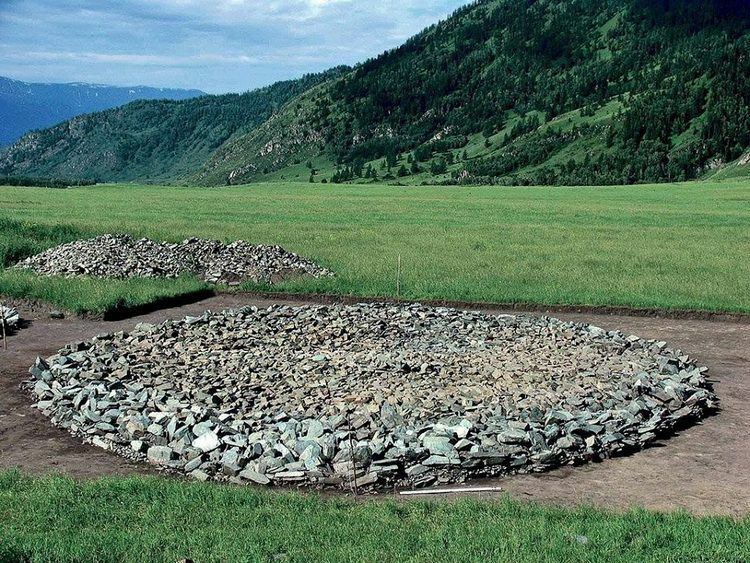 Some of the most illuminating discoveries supporting this revised image are now coming from burial mounds, called kurgans, in the Altai Mountains of eastern Kazakhstan, near the borders with Russia and China. From the quality and workmanship of the artifacts and the number of sacrificed horses, archaeologists have concluded that these were burials of the society’s elite in the late fourth and early third centuries B.C. 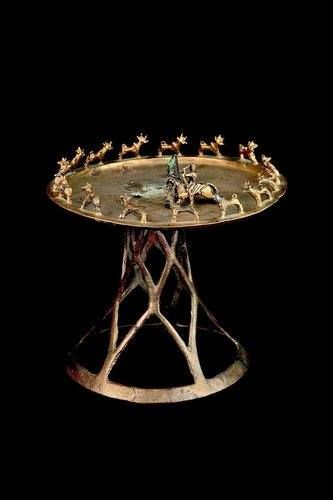 By gift, barter or theft, they had acquired prestige goods, and in time their artisans adapted them in their own impressive artistic repertory. Almost half of the 250 objects in a new exhibition, “Nomads and Networks: The Ancient Art and Culture of Kazakhstan,” are from these burials of a people known as the Pazyryk culture. 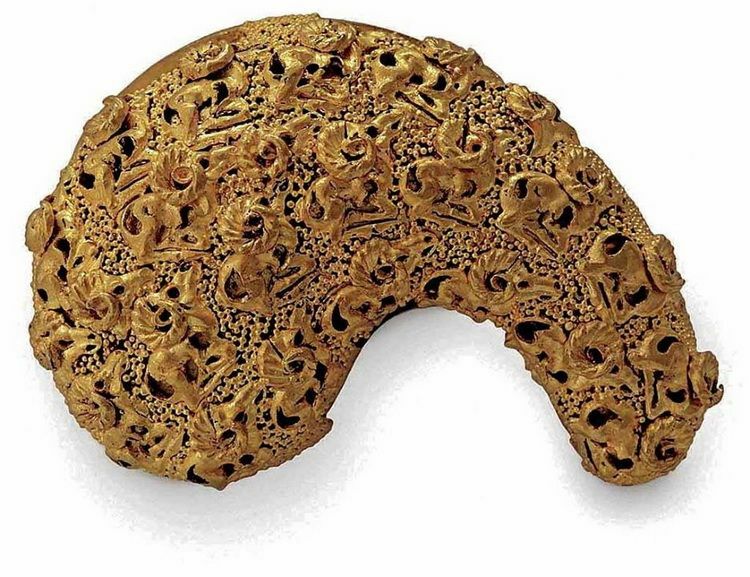 The material, much of which is on public display for the first time, can be seen at the Institute for the Study of the Ancient World at New York University, on loan from Kazakhstan’s four national museums. 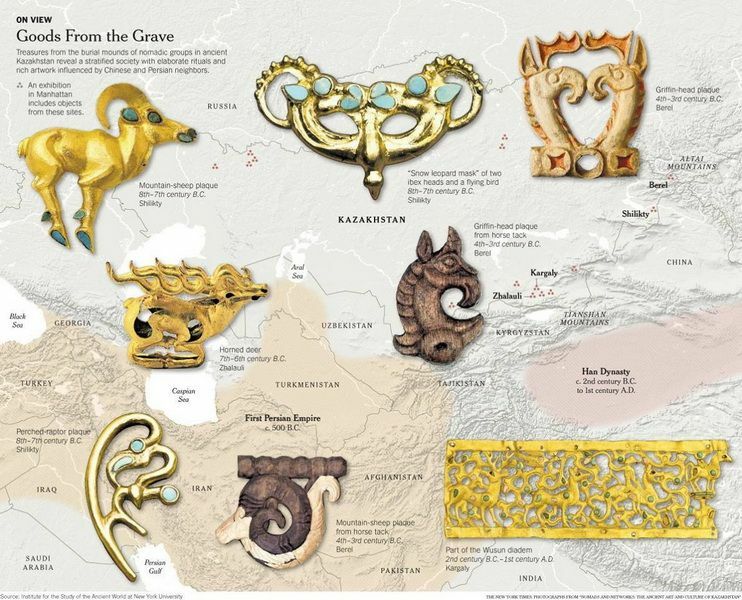 Two quietly spectacular examples are 13 gold pieces of personal adornment, known as the Zhalauli treasure of fanciful animal figures; and the Wusun diadem, a gold openwork piece with inlaid semiprecious stones from a burial in the Kargaly Valley in southern Kazakhstan. The diadem blends nomad and Chinese characteristics, including composite animals in the Scytho-Siberian style and a horned dragon in an undulating cloudscape. Walking through the exhibit, Dr. Chi pointed to nomad treasures, remarking, “The popular perception of these people as mere wanderers has not caught up with the new scholarship.”Excavation at the Altai kurgans, near the village of Berel, was begun in 1998 by a team led by Zainolla S. Samashev, director of the Margulan Institute of Archaeology, on a natural terrace above the Bukhtarma River. Some work had been done there by Russians in the 19th century. But the four long lines of kurgans, at least 70 clearly visible, invited more systematic exploration. Of the 24 Berel kurgans investigated so far, Dr. Samashev said in an interview, the two he started with were among the largest. 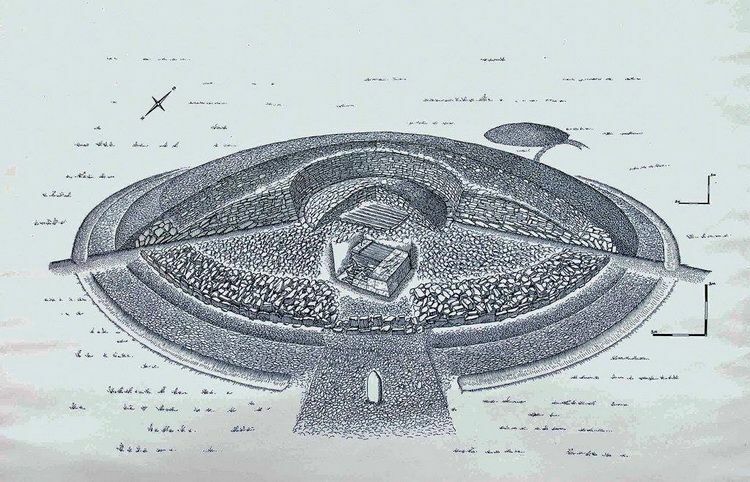 The mounds, about 100 feet in diameter, rise about 10 to 15 feet above the surrounding surface. The pit itself is about 13 feet deep and lined with logs. At the base of Kurgan 11, he said, the arrangement of huge stones let the cold air in but not out. Dr. Samashev said that his international crew, which is limited by climate to summer work, had excavated at least one kurgan a year. Several were burials of lesser figures. These were usually only a man and one horse. Kurgan 11 had a man who apparently met a violent death in his 30s; a woman who died later; and 13 horses, dressed in formal regalia before they were sacrificed. So many horses, found in a separate section of the pit, affirmed the man’s lofty social status. 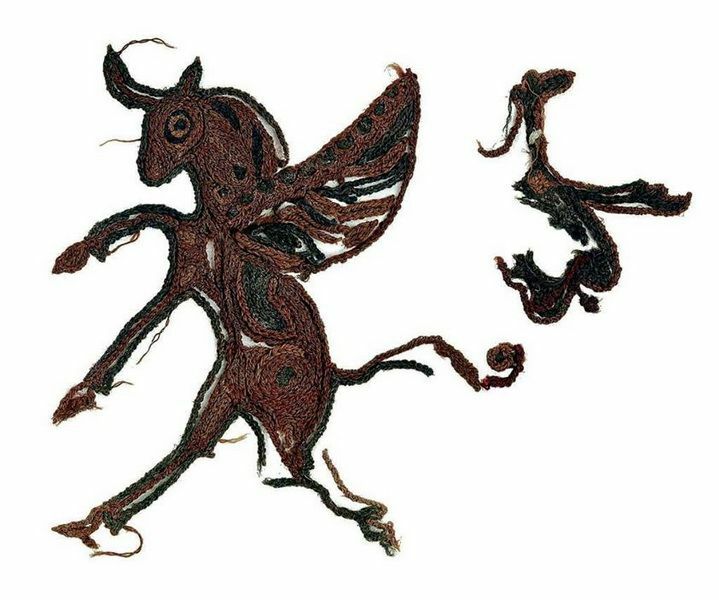 Their leather saddles with embroidered cloth survived, as well as bridle and other tack decorated with plaques of real and mythical animals — like griffins, which had the body of a tiger or lion with wings and the head of a bird. 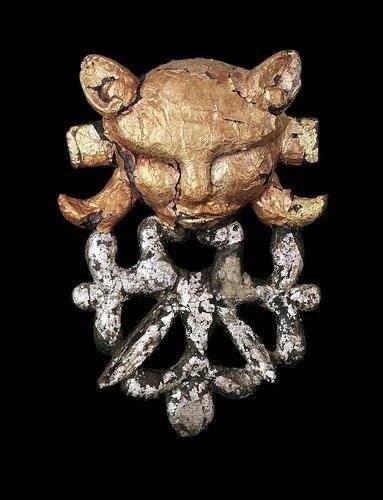 Soren Stark, an assistant professor of Central Asian art and archaeology at the N.Y.U. institute, said networks of contacts with the outside world were crucial to the political structure of the people throughout the Altai and Tianshan Mountains. On the most basic level, they moved with the seasons by horse and camel, tending the flocks of sheep and goats that gave them the meat, milk, wool and hides of their pastoral economy. To make the most out of grasslands that were only seasonally productive, they went in small family groups into the highland meadows for summer grazing and returned to the lowlands in winter. They crossed broad plains to avoid overgrazing any one marginal pasture. Correction: March 14, 2012 - An article on Tuesday about the excavation of nomads’ burial mounds in Kazakhstan misspelled the name of the society whose artifacts are the focus of the “Nomads and Networks” exhibition at the Institute for the Study of the Ancient World at New York University. It is the Pazyryk society, not Pazyrk. “Nomads and Networks” will continue through June 3 at the Institute for the Study of the Ancient World, 15 East 84th Street, Manhattan. Information is at isaw.nyu.edu.